Logging railroads are perhaps the most unique and interesting aspect of the industry. Nearly every timber-rich state contained at least one although only the largest remained in operation through the post-World War II period. Many were privately held while others did contain a common-carrier charter. Unfortunately, several have been lost to history as not every company kept detailed records of their rail operations (in other cases the information was not retained). What made these so interesting was the rudimentary construction and operating techniques they employed. Many featured brutal grades of up to 11% that conventional railroads could economically not traverse. In addition, others forewent the cost of bridges and simply forded small streams or creeks. As highways improved and heavy, industrial-grade trucks were introduced many companies dropped their rail services at an early period. These motorized vehicles were cheaper than railroads and could operate wherever makeshift roads were laid down. 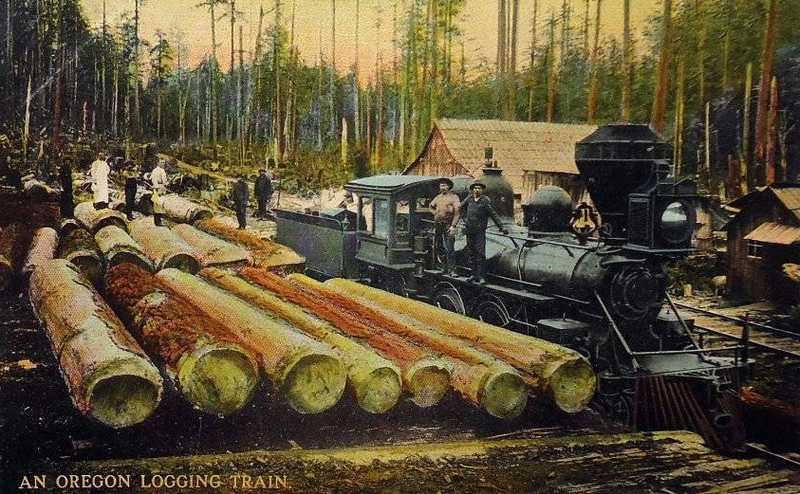 Today, there is only one known true logging railroad still in operation throughout North America, the Englewood Railway on northern Vancouver Island, Canada. To provide an example of just how prolific logging railroads once were the book, "Logging Railroads Of South Carolina," by author Thomas Fetters (Heimberger House Publishing Company, 1990) details 258 operations in that state alone. There have been many other, similar titles published over the years highlighting these operations, ranging from California and Oregon to the Blue Ridge and Smoky Mountains! The amount of work these authors put in to produce these outstanding historical resources can simply not go unmentioned. For any historian or researcher interested in logging railroads the time and effort folks like Mr. Fetters, Benjamin Kline, Bill Gove, John Labbe, Peter Replinger, Kramer Adams, and William Warden gave to shed light on these little known operations is simply incredible. 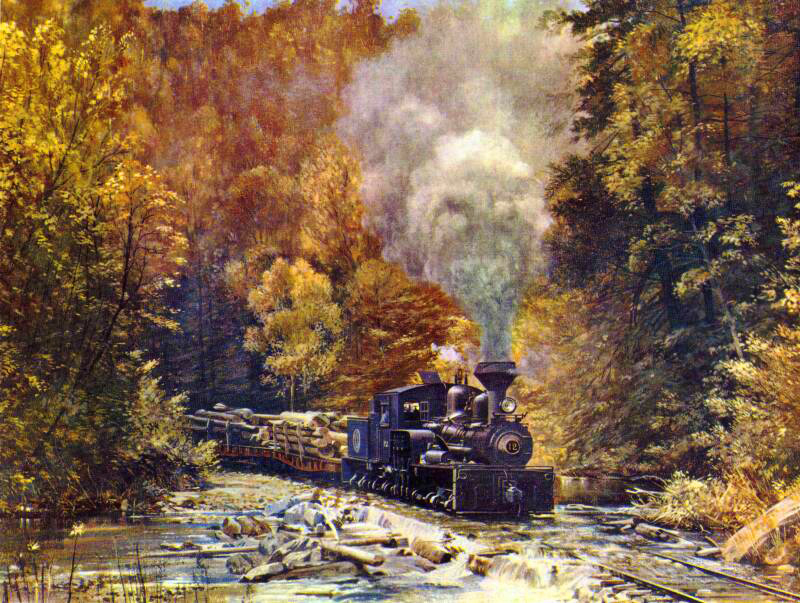 Mr. Fetters, in particular, highlighted the difficulty in his book, "Logging Railroads Of The Ridge And Smoky Mountains: Volume I" by saying: "The logging railroads that were built into the deep mountain valleys and up onto the peaks and ridges of the range are largely unknown today, even to Forest Rangers who profess to know their territory well." New Mexico, Logging In "The Land Of Enchantment"
"The search for material on these independent railway lines, both chartered common carriers and primitive wood-railed temporary creations, was difficult. I depend on a number of men and women to search out men who had worked on these lines, men who owned the companies, and people who still recalled hearing the mournful echoes of the sidewinders in the hills." Some of the earliest, true logging railroads date back to the 1860s and 1870s, operating in northeastern states such as New Hampshire and Vermont. Logging had been a major industry for years, practically since the nation's creation. However, until the development of railroads there was no, true economical way to do so on a large, commercial scale. Up until that time timber had been largely moved by floating logs down a wide creek or river. In addition, horses or mules were sometimes utilized although this was a slow and tedious process. The lumberman of the era must have been quite frustrated; there were thousands upon thousands of virgin timber acreage to be tapped if only a better means of transporting the logs was available. When railroads found their way to America in the late 1820's this new mode of transportation certainly offered hope for the timber industry. Ironically, many years would still pass before the iron horse could be effectively harnessed for logging applications. The problem lay in where many operations were located; rugged and rural countryside that was difficult to reach. In addition, many companies didn't want the expense of constructing a well-engineered rail grade, the traditional way a railroad was designed and built to minimize gradients. These corridors required fill and cuts, at the least, while some also needed bridges and tunnels. In certain areas this need could be avoided entirely, such as the flat coastal plains of eastern Virginia, Louisiana, and South Carolina. Within these states a quick railroad, utilizing rough-cut ties, could be hacked out of the wilderness and ready for service in short order, needing only minimal grading. For the most part, however, this was not an option. In mountainous terrain, such as the photo above illustrates, the terrain required a traditional railroad unless a new type of locomotive could be utilized. That new design arrived when Ephraim Shay invented the geared locomotive. The Shay locomotive dates to the late 1870s when Mr. Shay realized he might have something which could greatly benefit the timber industry. After working with the Lima Locomotive Works (based in Lima, Ohio) Shay sold his first locomotive in 1880 to a small railroad in Michigan. Soon after this sale transpired others soon recognized the Shay's advantages and sales took off. The second geared model to debut was the Climax. This particular design traces to 1884 when Charles Scott of the Climax Machinery Company unveiled his own style of geared locomotive. Its notable advantages included being easier to maintain and accommodating a larger boiler. These features, along with a lower price tag, made the Climax an enticing choice over the Shay for many. However, the Climax never witnessed the strong sales (around 1,100 built), likely do to entering the market after the Shay was already an established product. The last noteworthy model was the Heisler. This locomotive was created by Charles L. Heisler, and first hit the market during the 1890's. At first it was built and manufactured by the Stearns Manufacturing Company while later the Heisler Locomotive Works began selling the design itself. The Heisler, while similar in appearance to the Shay, was almost identical in operation to the Climax. The primary different was its piston rods, which were angled at forty-five degrees instead of the twenty-five degrees on the Climax. Seeing these and other types of geared locomotives in action was a true sight to behold. Not only could they operate over rough, uneven, and poorly-built track conditions (Shays did have an inherent flaw. The poor track conditions sometimes caused the locomotives to run right off the rails for what appeared to be no reason at all. ), but also were designed in such a way that all wheels provided traction which afforded them tremendous levels of adhesion. With the Shay's introduction logger now had a reliable and rugged means of transporting their product off the mountain. They began rapidly lying down either private or chartered railroads to serve their timber interests. Given their flexibility it was not uncommon watching them ford streams and creeks! The reason was all driven by cost; bridges were expensive as was a right-of-way and since steam locomotives contained no electrical traction motors (like diesels) they had no issues getting wet, as long as water did not reach the boiler. 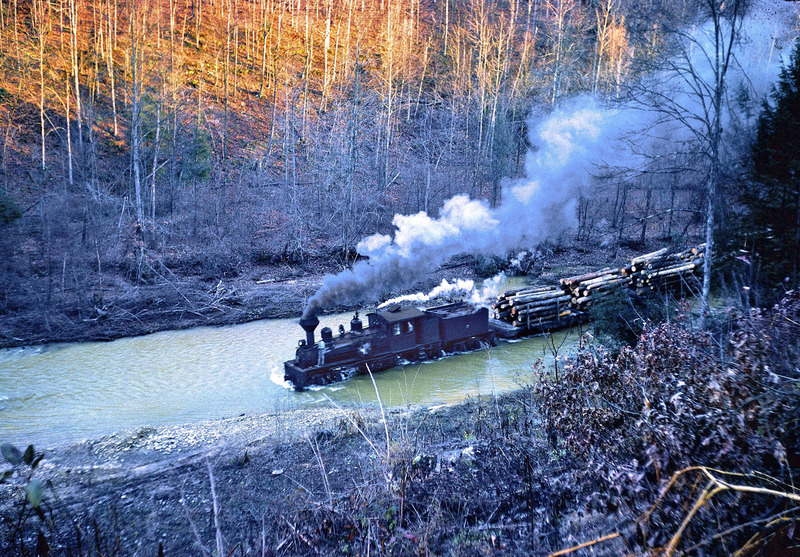 By the early 20th century about half the states featured at least a few such railroads with most located in the largest timber tracts of the Appalachians, New England, and Pacific Northwest. 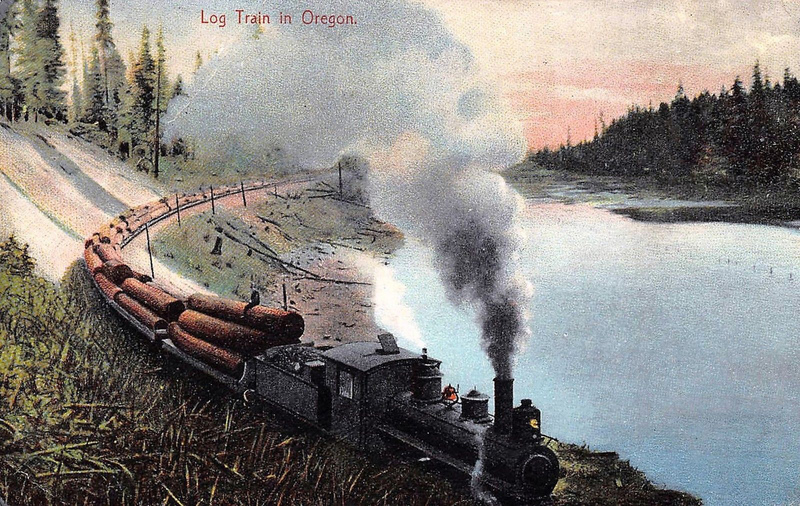 Often times timber companies constructed their mills near or beside their railroads since it offered the most economical means of unloading raw logs for production. Additionally, these usually connected to a larger, main line railroad, in transporting finished products to market. Perhaps most notable here was that which was the Chesapeake & Ohio's Greenbrier Branch in West Virginia. The line followed the Greenbrier River north from its main line Ronceverte and terminated near Durbin where interchange was established with the Western Maryland. It ran through the heart of the Mountain State's vast virgin timber tracts where numerous private logging companies operated. By the early 1960s nearly all of the classic logging lines had been either shutdown or sold. Those still operating largely retired their Shays, Heislers, and Climaxes for more economical diesel switchers. 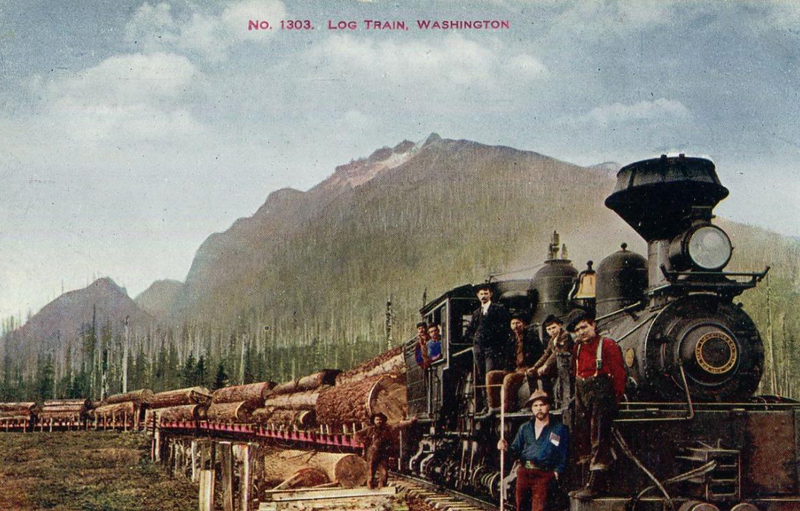 Today, there are no longer logging railroads operating in the United States. The last, Simpson Railroad, shutdown in 2015. It was located west of Tacoma and north of Olympia, Washington, with a history tracing back to the 1880s. This section will attempt to briefly cover as many as possible in a state-by-state fashion (listed above) utilizing the book resources and other materials available.